Saturn will form a triangle in the night sky with the bright stars Spica and Arcturus. 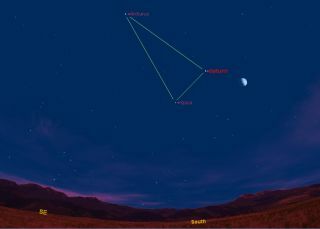 This sky map shows how the triangle appears at about 9 pm local time in midnorthern latitudes. If you're outside soon after it gets sufficiently dark to see the stars this week, you may notice a large and slender isosceles triangle high in the southern night sky. The triangle appears tipped to the left, with the vertex poised high above the base; the triangle itself seems to be pointing toward the point directly overhead (called the zenith). So what is this other eye-catching triangle of three bright stars? Actually ... only two of the three stars in the prominent isosceles triangle are stars. One of the "stars" is actually a planet! And as a result, this triangular pattern will appear to alter its shape in the weeks and months to come. Saturn's rings, visible in any telescope magnifying at least 30-power, are currently tilted 7.3 degrees, the smallest for this year. In the course of the next six years the rings will gradually "open out," eventually reaching a maximum tilt toward Earth in October 2017. The third star in the triangle is the brilliant yellow-orange Arcturus in the constellation, Boötes. The triangle will remain in view until around 2 a.m. local time. By then, Saturn and Spica will be low on the west-southwest horizon and will soon set. Arcturus will remain in view, however, until the break of dawn. As we noted earlier, thanks to the fact that a planet is part of this night sky triangle configuration, it's not going to remain this way for long. On June 13, Saturn will seem to come to a halt against the background stars as it's retrograde or "backwards motion" comes to an end. Since late January, Saturn has been plodding slowly to the west, but after June 13 it will reverse course and start moving to the east toward Spica. That means that the base of the triangle will be getting smaller and the triangle itself will appear to get narrower as the summer progresses. By late September, Saturn and Spica will be getting too low in the western evening sky and too deeply immersed in the evening twilight to be seen. When they again become visible, it will be during early November, low in the east-southeast before sunrise. But now, the Saturn-Spica-Arcturus pattern will no longer resemble a triangle, but rather more of a straight line. That pretty much will be the case through next year, but two years from now, in the late spring and summer of 2013, our attractive isosceles triangle will return. Except Saturn and Spica will have exchanged their positions in the base of the triangle and the triangle itself will seem to be tipped to the right, not the left. This sky map shows the Saturn triangle configuration of the ringed planet, the bright star Spica and the moon on June 10 at 9 p.m. local time to skywatchers in mid-northern latitudes. And if you can't get enough of triangles in our current evening sky, be sure to check out the scene soon after sunset on Friday (June 10), when the moon joins the show. The apparent distances between objects in the night sky can be measured in terms of degrees. Your clenched fist held at arm's length, for example, could cover about 10 degrees of arc. On Friday, Saturn will be high in the south-southwest at dusk and will appear to form a rather broad triangle with the waxing gibbous moon, about 10 degrees below it and Spica, about 15 degrees to Saturn's lower left.